The What: Sony has launched its first Artificial Intelligence (AI)-based Edge Analytics solution, the REA-C1000, which allows users to create video content in real time, without the need for specialized training, additional staff, or equipment. The What Else: The compact and lightweight REA-C1000 uses AI-based video analytics technology to analyze the input it receives from connected cameras and automatically extracts the object in focus to combine it with other images in real time on a GPU (Graphics Processor Unit). This technology, using motion/face detection and color/shape recognition, effectively makes the REA-C1000 the brain of any connected camera and AV setup, allowing education, government, and corporate organizations to create professional content that keeps audiences engaged. By optimizing parameters and processing the images received from the camera, the REA-C1000 can extract handwritten objects from black and white boards using Sony's moving/unmoving object detection algorithm. This allows audiences to clearly see written content and diagrams, while simultaneously being able to see the gestures and expressions of the presenter. 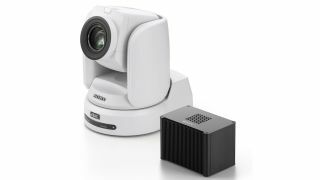 This function of the REA-C1000 is particularly well suited for lecture theaters or remote learning to keep students engaged, even if they aren't physically in the same room as their teacher. Additionally, it helps all members of an audience to engage in a live presentation, in a large hall requiring sub-monitors. Based on Sony's motion detection technology, the REA-C1000's chroma keyless function can extract the presenter and overlay them onto any background without the need for a dedicated green screen or specialized training. This offers an effective chroma-key solution to make content like corporate videos, interviews, webinars, and e-learning materials much more appealing and engaging. This feature will be made available through a future software update later in 2019. The REA-C1000 can accurately and smoothly track a presenter, ensuring they constantly stay in frame and in focus throughout their presentation. This feature offers users a cost-effective tracking solution in an education, corporate, or conference setting, without having to invest in a camera operator. The REA-C1000 can detect and react to the gestures of audience members, showing both the whole image and zoomed image in real time. When an audience member stands up, the REA-C1000 can trigger the camera to electronically auto-zoom in on that person, which is particularly useful in educational environments to measure students’ reaction and incorporate presentation settings, such as during a Q&A session. After an initial 60-day free-of-charge trial period, each feature can be activated permanently through separate licenses, providing users with the freedom to customize features based on their individual needs and budget. The Bottom Line: Leveraging Sony’s imaging expertise and its heritage in camera development, the REA-C1000 will support 4K/HD input and output, and will be able to connect directly to Sony’s PTZ cameras, including its range of XDCAM camcorders, which are are widely used within the broadcast industry. Additionally, with HDMI network connection, the REA-C1000 can integrate into various common AV setups involving either multiple displays, large-screen projections with monitors, or even live-streaming projects.